Embodying Thailand’s traditional "wai": a warm gesture of welcome across the country. 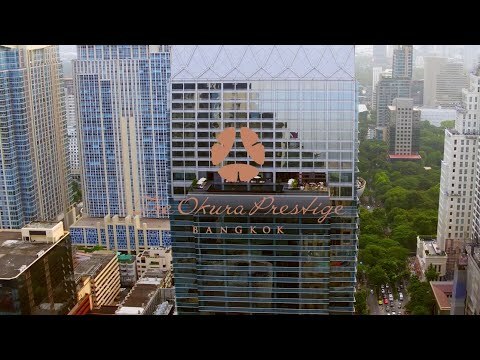 The Okura Prestige Bangkok is situated at the intersection of Wireless Road, known as "Embassy Row", and Ploenchit Road, the city’s leading commercial district, conveniently located for both business and leisure travelers. The hotel embraces an Asian design that harmonizes Japanese and Thai cultures, and boasts cutting-edge facilities and Okura’s original hospitality principles of calmness and comfort to ensure that guests have an enjoyable stay. All accommodations are located above the 26th floor and offer spectacular panoramic city views, comfortable furnishings and modern conveniences. Guests staying on the Club floor will have access to a comprehensive breakfast buffet, refreshment throughout the day, as well as complimentary evening cocktails at the Club Lounge. The hotel’s innovative, energy-efficient building boasts cutting-edge technology and a design inspired by the “Wai,” a traditional Thai greeting. The Okura Prestige is located in the heart of Bangkok’s Central Business District, close to shopping malls and tourist attractions. The hotel is directly connected to the Ploenchit Skytrain station, and is also an easy drive from Bangkok’s international airport.